We had several cancelations yesterday, so please sign up with us for this Saturday's "Good Friends" reading clubs! We are particularly in need of volunteers to be Grade Level Coordinators, Training Coordinators, Food Runners, and Site Coordinators at several of our schools! We also need two folk to pick up bagels for us tomorrow afternoon in Marina del Rey or Santa Monica. If you have volunteered with us at least a couple of times and can help in any of these roles, please email us at info@readingtokids.org. We can even add you in for one of those roles if your school is full, especially if you can be a Site Coordinator! If you signed up for the reading clubs but can't join us, please cancel your RSVP so another volunteer can take your place! Last week one of our most dedicated volunteers at Esperanza Elementary, Cliff Marcus, passed away at 98 years old. 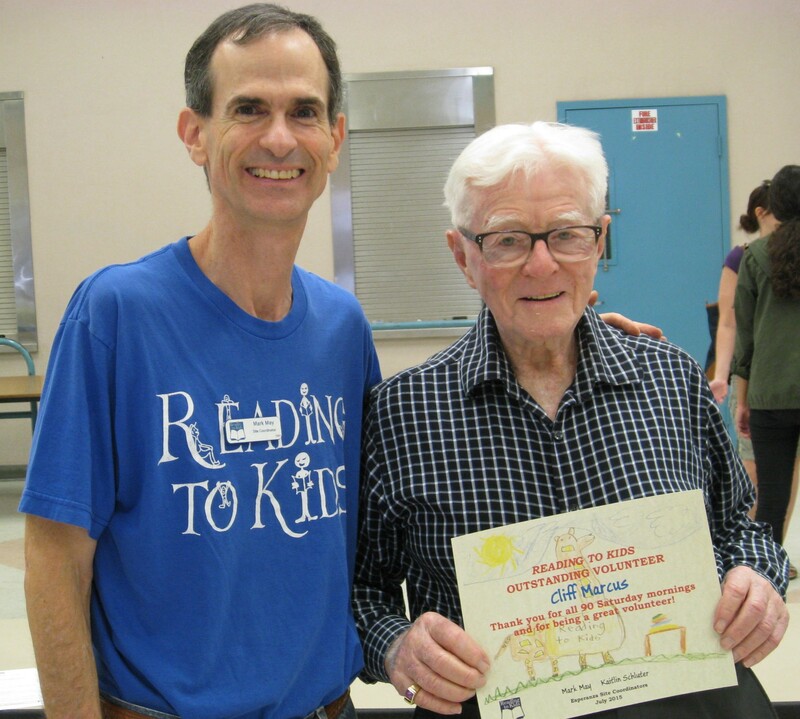 In the photo above, Mark May (Esperanza Site Coordinator) presents to Cliff Marcus his 90th reading club Milestone Certificate in July, 2015. Cliff first volunteered with Reading to Kids in April 2005, reading exclusively to third graders at 115 of our reading clubs. Cliff usually read with his friend of 40+ years, Jim Ostiller, and Jim's daughter Cathy Ostiller. Cliff rarely missed reading with us, even returning to volunteering after he broke his neck in a fall! Cliff was an avid golfer and golf fan, loved his neighbor’s black Lab, Lewey, and was the last living WWII veteran many of us knew. He was known for his energy and respect for the minds and futures of the 3rd graders he enjoyed reading to each month, as well as for his enjoyment of our bagels with cream cheese and jelly. Reading to Kids is honored to have had Cliff volunteer with our program for 13 years. When asked what motivated him to read with us, Cliff told us back in 2012, "There's a gratification when students remember you and acknowledge you from previous reading clubs, that we make a difference in a kid’s life down the line." The same is true for the difference Cliff has made in the lives of all of us who knew him. A ceremony celebrating Cliff's life is at 2:00 pm tomorrow, Feb. 8th, in the chapel at Woodlawn Cemetery, 1847 14th St., Santa Monica, CA 90404. We're looking for two more marathon runners to join us in one of the best marathons in the country. 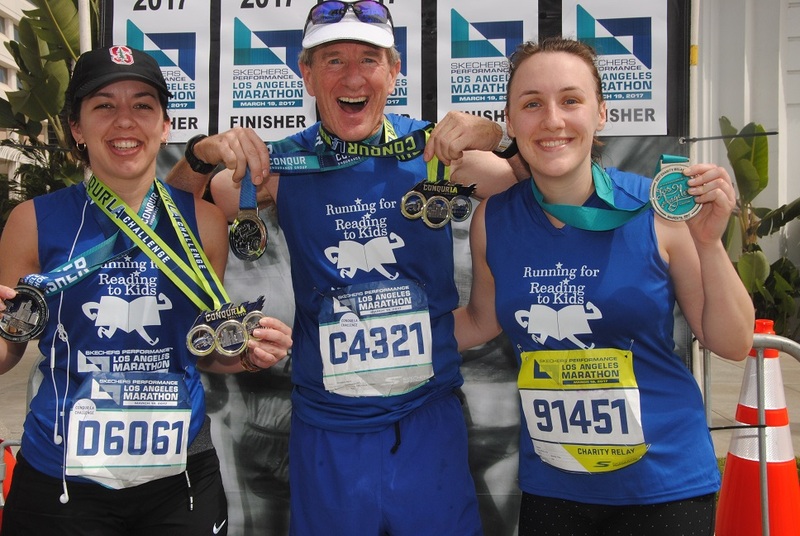 If running 26 miles is too daunting, you can join us in the Big 5K (that's just 3.1 miles) around Dodger Stadium the day before the marathon on Saturday, March 23. You can share this Facebook group with any of your runner friends to encourage them to join our team! If you are interested or want to learn more, please email Chris Martin at marathon@readingtokids.org! CAN'T RUN 26 MILES OR 5K? OR HAND OUT WATER DURING THE RACE! 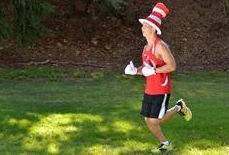 Please support Team Reading to Kids as they run the Skechers Performance Los Angeles Marathon on March 24th! They have until March 24th to reach their $20,000 fundraising goal! If you can donate a buck a mile to your favorite runner, you'll help fuel them towards the finish line! With every mile they train and every dollar they raise, these valiant souls help you inspire kids with a love of reading. HAND OUT WATER DURING THE RACE! Help represent Reading to Kids during the marathon by handing out water to the runners! You get a free LA Marathon t-shirt, too. Our group will be at Water Station Mile 5 at Glendale Blvd., between Bellevue and Kent St. in Echo Park, on Sunday, March 24th from 5am - 11am. Click this link to sign up. Our group is Reading to Kids and our shift location should be listed in green. Click the box to the green J05 Water Station Mile 5 shift, scroll down and complete the form, and sign up to volunteer! 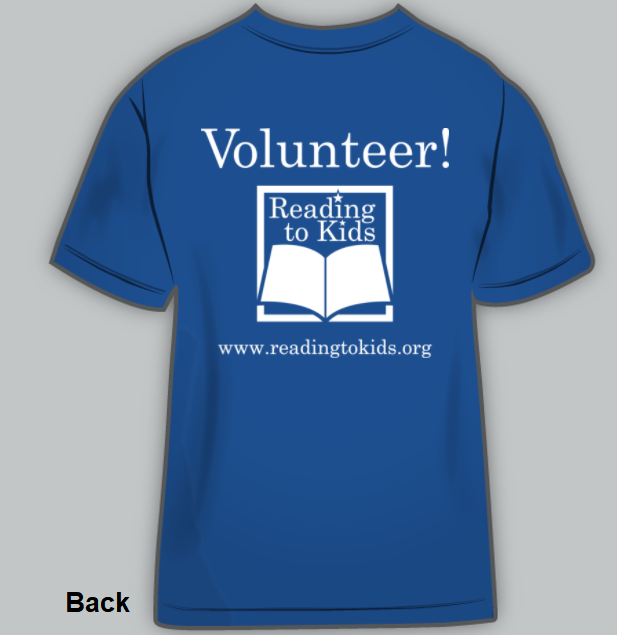 BUY A READING TO KIDS T-SHIRT BY SUNDAY, 2/24! 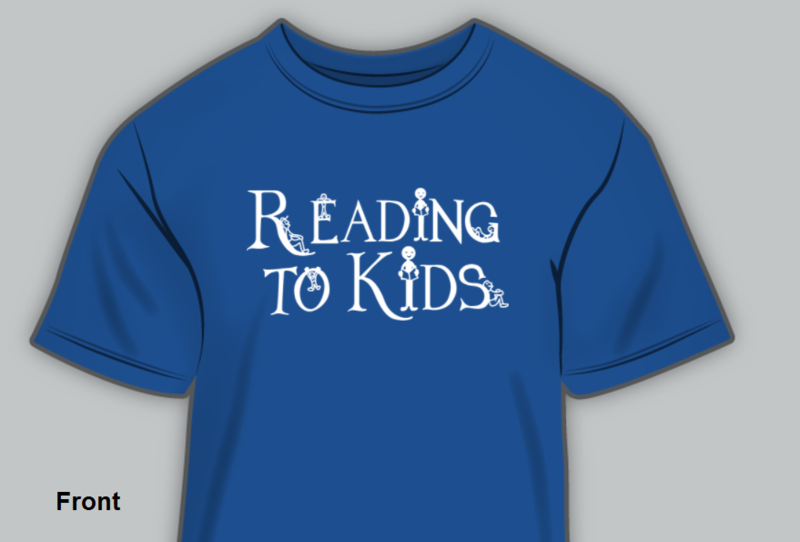 It's time once again to get your very own Reading to Kids t-shirt! We have a group order ending Sunday, February 24th, so please head over to our Order a T-Shirt link for all the details on how you can order your own shirt like the one shown above. That Order a T-Shirt link is also available in the lower left-hand side of our website. The more t-shirts ordered by the 2/24 deadline, the less expensive they will be! Thanks, and we hope to see you this Saturday! 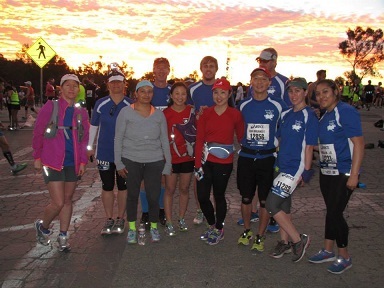 - 2 Ways YOU Can Support our Runners!